We promised more surprises from Victoria Antolini. Here is one more! The little paper boat dreamed of reaching the ocean, even if he didn't know what it looked like. In a fantastic journey, the paper boat meets many friends and not so friendly creatures along the way, but he never gives up! Will he make it out to sea? Join along to find out! A magical interactive story for all ages about courage, tenacity and the wonders of the sea for phones, tablets, and computers. Please pledge, and share this link! Go wild. There are amazing rewards, not only the app itself, and for every budget -- the smallest pledge is only 5 Canadian dollars. It REALLY matters that the pledges come in today and tomorrow -- momentum is everything for the project success. THANKS!!!! It's great that the kickstarter page is up and running. Hopefully there will be lots of pledges. Good luck to Victoria! Wow, very cool! 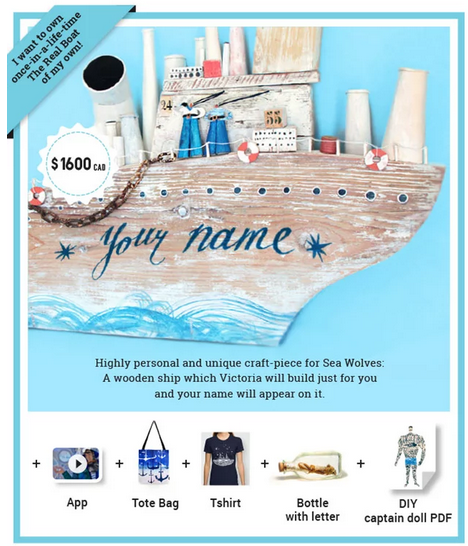 Congrats to Victoria for getting her kickstarter campaign up. I hope she does well! Great page!! Congrats on the kickstarter! Love it! I will check it out. Thanks for passing it along. Kickstarter has some great products on it.